Trying to keep your kids happy? Stop. Kids know how to be happy. What they need to learn is how to deal with suffering and to move on without bitterness. With all the emphasis on happiness circulating around those dispensing advice to parents, pain tolerance is neglected. Not good. How do you build pain tolerance in your children? Here are six parenting tips that will help. Parenting tip one: Self-soothing is an essential skill when it comes to enduring life’s slings and arrows. Self-soothing skills can be taught at any age, but when teaching, remember age and stage. Infants need to learn the ABC’s of self’-soothing. That is done by not rushing to comfort. Sleep is the best time to ignore cries for help. Most night-time criers will cry themselves to sleep or back to sleep and wake up happy and cheerful. Parenting tip three: When the child can talk fairly well teach Calming Breath . See this Breathing Buddies link. Add lots of other self soothing skills particularly Remember What Matters. See the link to Creating Calm for more suggestions. Parenting tip four: By the time a child enters school, you can talk more about learning to understand and tolerate pain. 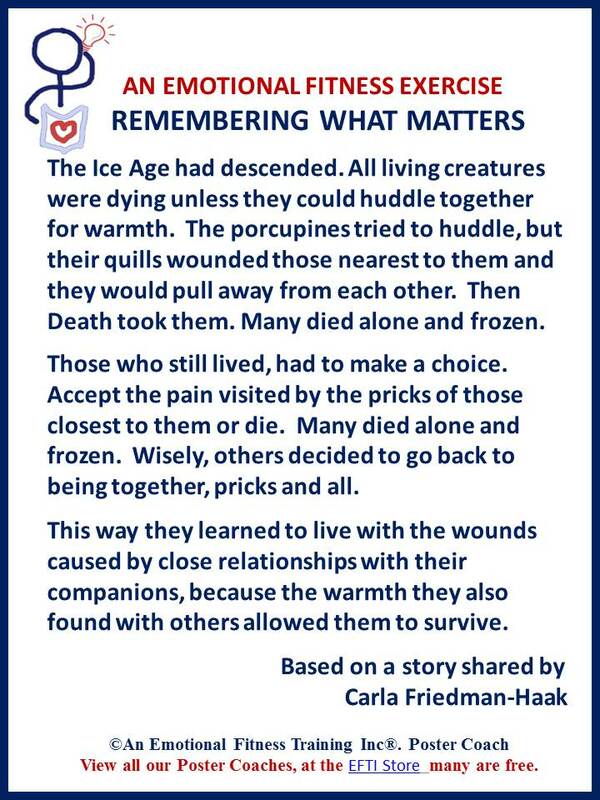 Use the Porcupine story to teach that hurt is part of all relationships. As pain can lead to the desire to hurt others, it is also important to teach making amends and forgiveness. Parenting tip five: Teach teens the art of winning Gotcha Wars. That means you need to learn that art. See the link for my book of the same name. Parenting tip six: Get your child self-defense training. FTolearating pain and forgiving others does not mean allowing abuse. Moreover, self-defense boosts self-confidence. Take family lessons. Best resource for this: Peace Jojos. As always you need to model what you teach. Bad news? Not really for by teaching these skills strengthens them. As you teach your child, you will increase your ability to tolerate pain and add to your ability to enjoy the good. Another way to survive the pricks of close relationships is to follow the Five in One Rule. That rule? For every prick there must be five kisses or the equivalent of kisses. And as always abuse cannot be tolerated. I use these prompt ideas to think about what to write. If I know what I am going to write, the prompts challenge me to see if what I wrote fits in with the prompt. Here’s this post’s prompt. Third From the Top: Head to “Blogs I Follow” in the Reader. Scroll down to the third post in the list. Take the third sentence in the post, and work it into your own. The laughs on the Daily Prompt for the third post was just a picture as for many bloggers it is Wordless Wednesdays and only pictures are posted. I hadn’t heard of Wordless Wednesdays, but now I know and I will now declare some posts as . Not this one, but I did work a picture into it via a Poster Coach. Of course Poster Coaches are not wordless, but will work for me, when I do not have time to post. This entry was posted in Parenting Issues and tagged Challenged Children, Emotional fitness, Emotional Fitness Training, emotional intelligence, help for parents, how to parent, Katherine Gordy Levine, Pain tolerance, parenting tips, Parents Are People Too, postaday, teens. Bookmark the permalink.